It's November and while the rest of the United States is thinking Thanksgiving and election, we took a moment to revere the humble polenta. Polenta was a peasant's food, and not always made from ground corn. In Roman times the grain was often ground chickpeas, or mullet, or other readily available grain. The grain is ground, boiled with water and served with salted fish or a sauce. When you read about gruel or mush, you are often reading about polenta. In this decade, polenta has become a food that gourmands are using in all kinds of ways. This breakfast polenta is such an example. Very simple to make, and very delicious. Bring water to a boil. Add salt, turn water down and add cornmeal in a stream. Whisk briskly so no lumps form. Fry bacon slices, drain on paper towels. Add onions to the grease, cook until transparent, add mushrooms. Chop bacon and add to mixture. Scoop and remove from grease. Fry two eggs sunnyside up. Place a scoop of polenta in a large bowl. Top with onions and mushrooms. Top with bacon and lastly top with a fried egg. Sprinkle with hot sauce, if desired. This is the basic dish. Doctor up the polenta with butter and maple syrup. Add other veggies and garlic to the onions and mushrooms. Go crazy, folks! I've never even considered polenta for breakfast, but that's just brilliant! What a hearty, delicious way to start the day. I have never heard of this. What an interesting idea. I'll have to try it and see if I like it for breakfast! What a great idea Terri. Looks so delicious. Drooling over here. 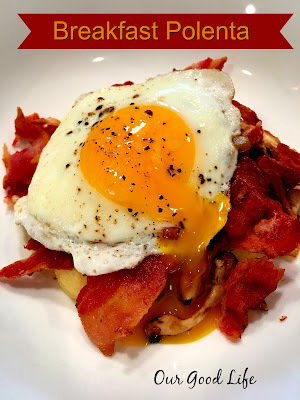 I am all about eggs (eat them daily), and I love polenta! This looks like a major win for a recipe!! Love your recipe Terri, and love, love, love your video!! It looks so amazing and professional. I love how you did it! Looks delicious! I will have to give polenta another try. I have never eaten this breakfast, but it sure looks like a beautiful dish and a great way to start the day! I don't think I've ever made polenta for breakfast but this looks like a fabulous idea! You always have such lovely recipes, Terri! 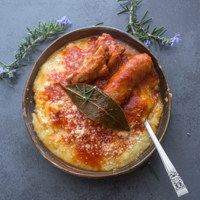 I've never tried polenta before, but now I may have to! I'm always looking to change up my morning routine and this is gold! thanks for sharing! Savory breakfast options are perfect for a late brunch. After this time change, I'm all about the brunch. I love this recipe idea for weekend guests! Anything with bacon tastes good. :-) I have only cooked with polenta twice and it turned out great. Love your recipe. Can you believe I have never had polenta? It sounds so delicious! I love polenta and for breakfast I'm sure it's simply delicious! Thanks for sharing dear! 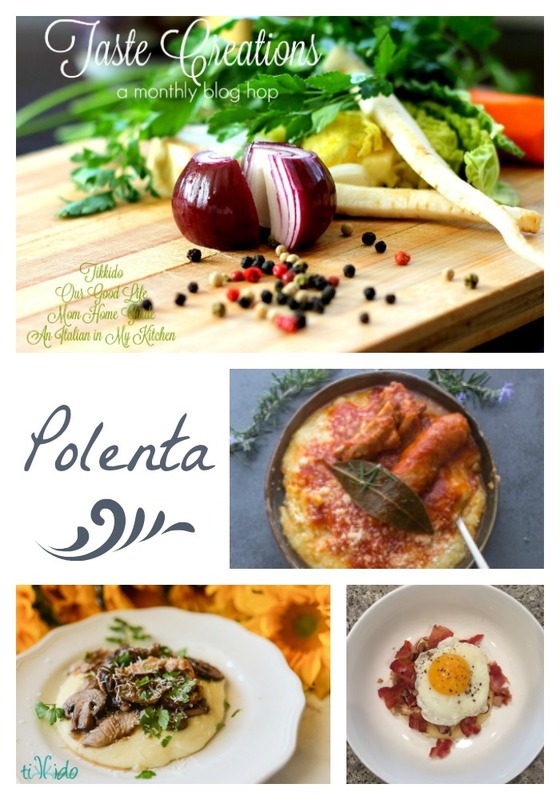 Breakfast is my favorite meal of the day but I don't think I have ever tried polenta! It looks delicious and I will definitely add it to the list! I haven't heard of polenta before. It looks very yummy though. I've never heard of polenta! It looks really delicious - especially the baked dish! I have never seen or heard of this but it looks really good. And easy to make. I have never made polenta before, but I am going to have to try your recipe. It would be a fun way to mix it up for breakfast. I have never heard of this dish before but it sounds delish! I am going to have to give this a try especially when we have company. I have never even heard of polenta??? Definitely something I need to try. I love trying new things and so does my husband!! This is getting pinned! I love polenta! I wish I got to eat it more but I'm the only one in the family that enjoys it! This is a nice breakfast idea! I like that it's not difficult to make during the morning as well. It's really lovely. Yumm I love polenta and that's such a great idea having it for breakfast, since people have cornbread for breakfast, why not polenta!! My husband would absolutely love this. I need to save this recipe and make it for him! I have only had polenta on one occasion and it was on a 10 day kayak trip in the Adirondacks - and whoever prepared it decided to just mix it with tomato soup...yeah...I skipped dinner that day! This looks delicious! Much better, and perhaps I will try it! Yum! My family and I just started doing family Sunday breakfast and i'd love to throw this into our little tradition! Wow, that looks like the perfect egg on top of that dish. I'm impressed and wish mine looked like that! never heard of polenta before. Interesting and looked into the different versions of this. I've never had breakfast polenta but it looks really good. I'm a huge fan of eggs so I know that I would enjoy this recipe. This looks delicious! I have never been brave enough to tackle making polenta myself, but I may have to give it a try. I've never hear of Polenta but anything with bacon and eggs has to be good! I will have to make this for my hubby...breakfast is his favorite meal! I am intrigued. I have never had polenta and am curiius how it tastes. It's funny, I never knew it existed until only a few years ago! Polenta for breakfast sounds great! I need a good morning meal to fill me up now that I'm eating for 2! We have been eating a lot of polenta in our family this fall. We love it as a side dish to so many meals. Omg can we say yum?!?! 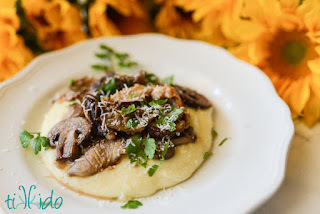 This polenta recipe would be perfect for Sunday brunch!!! I will have to give it a try one of these sundays! I just started eating polenta, only with fresh salsa mostly! :) I definitely needed some ideas on how to make a meal out of it - will be trying this out for sure! This sounds yummy. thanks for sharing a great breakfast idea!